Adrenal gland cancer is a treatable disease if it is caught in time. There are a number of types of adrenal cancer and this will determine your treatment options. Adrenal gland cancers occur when abnormal cells form in or travel to the adrenal glands from other parts of the body. It is often aggressive, though when found early, adrenal cancer can be cured. However, if the cancer has spread to areas of the body beyond the adrenal gland, a cure becomes less likely. Treatment can be used to delay progression or recurrence of the cancer. 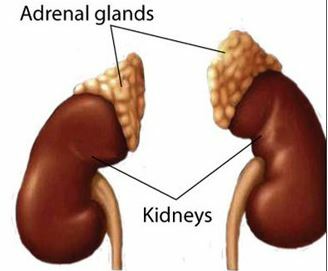 The adrenal glands are a part of the body’s endocrine system and they sit on top of the kidneys. They produce a number of essential hormones that the body needs to function normally. The glands are made up of two parts—the outer part called the cortex and the inner medulla. Adrenal cancers usually occur on the outer cortex. When a tumor develops in the adrenal glands it can often cause too much of a particular hormone to be produced and this will depend on the part of the adrenal gland affected. Some adrenal cancers do not cause this overproduction of hormones and don't cause any obvious symptoms. These are called non-functioning tumors. A noncancerous tumor on the adrenal gland is a benign adenoma. Benign adenomas are relatively small, usually less than 2 inches in diameter. Most people with this type of tumor have no symptoms. Cancerous tumors are larger. What Causes Adrenal Gland Cancer? Laparoscopic adrenalectomy—small incisions are made in the abdomen to remove the tumor using a small camera. Transabdominal surgery—a large incision is made in the abdomen to remove the tumor so the surgeon can check for tumors in other areas. Posterior surgery—an incision is made in the back to remove the tumor (the kidneys lie closer to the back). Thoracoabdominal surgery—an incision is made in the chest and abdomen to remove a particularly large tumor. Chemotherapy or radiation—this is used to treat tumors that have spread to other parts of the body. Medications—Mitotane and drugs like it may be prescribed for more advanced stages of adrenal cancer to prevent the adrenal glands from producing steroids. Adrenal gland cancer can return at any time so follow-up appointments with your doctor are important. You may have to take prescription hormones if you were on drugs like Mitotane for hormone suppression during your treatment.